MINING Minister Byron Chan has told parliament "the government is looking at taking over" the $5.6 billion (K11 billion) Frieda River copper-gold project, which is 81.82 per cent owned by GlencoreXstrata. Mr Chan -- the son of former prime minister Sir Julius, who is also a parliamentarian -- said the mine "is on the market", and that the government had the "expertise, knowledge and experience with finance and partners" to develop it. The project, in a remote area between the East and West Sepik provinces, is forecast to produce 204,000 tonnes of copper and 305,000 ounces of gold a year over an initial 20-year mine life -- making it one of the largest such deposits in the Asia-Pacific region. The core feasibility study was finished late last year, but further research is required before construction and production plans can be completed. "The project has not been prioritised by the company because of current developments in the world market," Mr Chan said. Glencore's chief executive, Ivan Glasenberg, said this year that the company was "afraid of greenfields" that were risky and had capital overruns. The PNG government has a legislated right to buy a stake of up to 30 per cent in all mines and has moved recently towards effective control of the large copper-gold mine at Ok Tedi, about 100km from Frieda, which employs a seasoned management team and workforce. A Glencore spokeswoman said yesterday: "We are assessing the interest of other investors in the Frieda River project, but there has been no decision at this stage to divest any part." John Gooding, managing director of Highlands Pacific, which owns the other 18.18 per cent of Frieda, with a pre-emptive clause, told The Australian yesterday: "This is a really proactive government in PNG that has been getting fairly frustrated with the delay in this project, about which we've been pretty disappointed as well. "We see the government's interest as a positive. We believe in the project, and we work well with the government." While PNG's economic growth spurt is being driven chiefly by ExxonMobil's construction of the country's first liquefied natural gas plant, its longer-term sustainability as a global resource centre hinges heavily on the development of the next generation of mines. ently: "When a company as big as Newcrest faces serious problems, we have to be concerned at the possible impact on our resource sector and our economy generally." A range of products from the Pacific which were showcased at the Pacific Breakfast event. A range of products from the Pacific was showcased at a Pacific Breakfast event on 9 July 2013, in the margins of the Fourth Global Review of Aid for Trade in Geneva, Switzerland. The event effectively brought the taste of the Pacific to Europe by serving freshly ground Tanna coffee from Vanuatu, and a range of jams, chutneys and herbal teas and infusions from Friends Fiji. An initiative of the Pacific Islands Trade and Investment (PT&I) network in Europe, the exploratory Pacific Breakfast event was successful in attracting around 100 people. Among the attendees were the Director General of the World Trade Organisation, Mr Pascal Lamy; the Deputy Prime Minister of Samoa, Hon. Fonotoe Pierre Lauofo; Minister for Trade from Papua New Guinea, Hon. 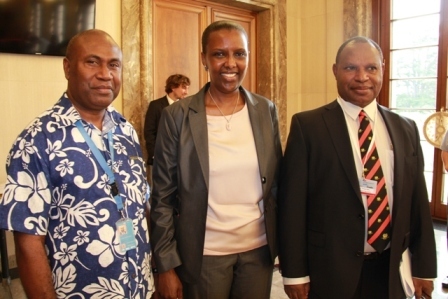 Richard Maru; and Ambassadors and international delegates attending the Aid for Trade events in Geneva. Solomon Islands Ambassador Moses Mose, WTO Deputy Director General Valentine Sendanyoye Rugwabiza and Papua New Guinea Trade Minister Honorable Richard Maru at the Pacific Breakfast. In introducing the event to the Guests, the Director of the Economic Governance Programme at the Pacific Islands Forum Secretariat, Mr Shiu Raj highlighted the uniqueness of the Pacific products. "Many of the high value niche products from the Pacific have a story that links to our cultures and traditions. These products are increasingly produced through ethical and sustainable practices and a number of Pacific products are being used by international chains and celebrities," Mr Raj said. The Pacific Showcase event profiled a selected range of Pacific product offerings that could enter into the European markets. 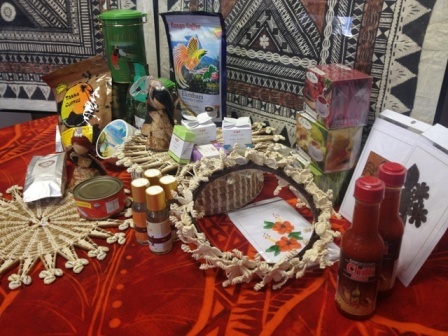 Guests were provided an overview of Pacific exports including boutique coffees from Papua New Guinea, Tonga and Vanuatu; chilli sauce from Samoa; canned tuna from Solomon Islands; and luxury personal care items including soaps and body oils from Fiji and Tonga. Other Pacific products such as vanilla, noni juice, cultural artefacts, jewellery and handicrafts were also on display at the event. "The response by the participants at the Pacific Showcase illustrates the interest that European consumers may have in Pacific products. Export opportunities for boutique, fair trade and niche organic products are real. Buyers and suppliers are encouraged to contact the PT&I desk in Geneva, which promotes and markets Pacific products in Europe," Mr Raj said. Long viewed as a niche market, the value of the European organic market has grown consistently over the last decade. Data presented at BioFach 2013, the World's leading Trade Fair for Organic Food, indicated that in 2011 the European market for organics was estimated to have had a value of 21.5 billion euros. In the same year, Germany alone had an estimated turnover of 6.6 billion euros. Significantly, in the larger European countries, it is estimated that approximately 25% of this demand is met by imported products. The Pacific Islands Trade and Invest in Europe promotes Pacific exports and assists in developing critical marketing channels and value chain linkages to enable Pacific Island exporters to establish their products in European markets. The PT&I also assists in enhancing access to technical support and establishing partnerships with agencies that can deliver practical assistance to address the challenges and impediments to increased trade with Europe. The presence of a PT&I desk in Europe has been made possible through the funding provided by the European Union, under the Pacific Integration Technical Assistance Project (PITAP), which is a component of the Strengthening Pacific Economic Integration through Trade (SPEITT) programme. AUSTRALIAN Prime Minister Kevin Rudd's recent visit has established his government's keen interest to develop the broad base for the PNG economy. Joined by his new trade and immigration ministers, Mr Rudd praised PNG's links with Indonesia and pointed to strong support for a regional approach to trade matters. Radio Australia's Pacific Beat program presenter Geraldine Coutts speaks to David Conn head of the Chamber of Commerce in Port Moresby. CONN: Obviously I think these visits, albeit a flash visit, are a good affirmation of the relationship. Yeah, it was a couple of snippets in there, it's a quick visit, generally, yeah I think the reaction to it was good. COUTTS: But what specifically were you talking about the LNG project, the projects that are already in mind or is there sort of smaller projects that you're talking about? CONN: I think that's, that's something that Prime Minister Rudd threw fairly clearly into his Trade Minister, Richard Marles, area and said look Richard, there's work for you to do. Clearly, there's a lot of continuation LNG, but I think Australia realises the maturing of that relationship between the countries, the broad base of the PNG economy has what this government's very keen to develop and Australia I think would be quite challenged to be able to assist Papua New Guinea in that SME sector, that's so vitally needed. COUTTS: Now, while Richard Marles is new to the portfolio, he's not a stranger to the region - so was he able to bring much to the table? Was there much substance of deals that you could do in the future? CONN: I mean I think it was basically when Richard was obviously very popular in certain quarters. I don't know who he spoke to. He certainly didn't speak to us, one of the biggest Chambers in the country I guess. So that's something we need to look forward to. But I mean in terms of trade negotiations, what can you achieve in a one-day flash visit. COUTTS: All right. So will there be more visits like this one in the future? Is it necessary? CONN: Oh, it's definitely necessary. I think PNG expects it, being our closest neighbour and I think the Australian government would make an error by not making these regular visits and for goodness sake, why not? I mean, Cairns, it's an hour to fly across. It's something we can, because of the relationship, every couple of months to the far north of Australia and there's a lot of links already between the far north of Australia and PNG. I think it's important Rudd said look, the people of Australia decide to re-elect me, I'll be back and I'm sure he will be and it'll be very early on its agenda. COUTTS: All right. Now, PNG , of course, has got regional links through the MSG and Indonesia. Is Australia looking to get in on that as well? CONN: Yeah, and I think that for me personally was probably one of the most sailent points that Prime Minister Rudd made. He said look, we can work on an economic triangle with Australia, Indonesia and Papua New Guinea and, of course, PNG has just had one of the biggest trade delegations ever sent overseas, the first in 27 years to Indonesia. So that's the sort of thing that rang our bells - we were very interested in that, because obviously, with an economy like Indonesia, sitting to the west of us, we'd have to say it's probably an even cheaper economy for PNG to access. That sort of comment was very welcome I think and ties in very much with PNG's not necessarily 'look north policy' but also to look to all areas to help improve, improve its economy and import less cost basically. THE long-struggling Hidden Valley gold and silver mine in Morobe province has turned a corner, says an industry source. The Hamata mill at the Hidden Valley mine in the Morobe province in PNG. Image courtesy of Harmony Gold. The newest mine in PNG, owned 50:50 by Newcrest Mining and Harmony Gold, is yet to hit its nameplate capacity of 250,000 ounces per annum gold since production started in September 2010. With March quarter operating costs of $A1790 an ounce, the mine was already burning cash before gold prices started to tumble in April. South Africa-based Harmony consequently flagged a write-down in June. 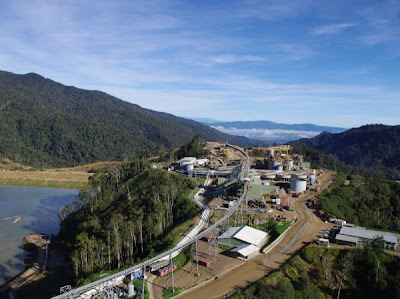 "At this early stage it appears likely that there will be a write-down of a portion of the carrying value of Hidden Valley in Papua New Guinea, due to its recent poor performance, and the reduction in the US dollar gold and silver prices," Harmony warned. However, there are signs that the joint venture's investments into the mine this year are starting to pay off. According to a source, news is spreading of a significant success at Hidden Valley, with production levels reaching 80% of planned capacity. This has "greatly reduced" costs, with the source claiming the improvement largely came from fixing problems with the mine's ball mill. Newcrest did not confirm this news to PNGIndustryNews.net, but a spokesman indicated that its June quarterly report next week might shed more light. Honourable Ministers, Neil Duffin, President of ExxonMobil Development Company, Mark Albers, Senior Vice President ExxonMobil Corporation, other senior executives of ExxonMobil Corporation, Peter Graham, Managing Director Esso Highlands Limited, project partners and guests, ladies and gentlemen. I have great pleasure to be here in New York with all of you for this official ceremony to mark the financial close for the PNG LNG Project. It has taken us almost three years to get to a stage where the co-venturers could commence spending US$15 billion to build this grand project. For my Government and our 6.5 million people, the PNG LNG Project holds so much opportunity and promise. It is a history-making, nation-changing, life-transforming project. Today, we are already seeing so much hope and optimism in Papua New Guinea. The tide of change has started to grip Papua New Guinea. It is my firm belief that this tide will transform the future landscape of Papua New Guinea forever. My Government has thoroughly enjoyed the robust engagement we have had in this journey to take one of our most important natural resources from a conceptual stage towards our mutual goal of making it a reality. The journey has taken us from our remotest villages and electorates to the corporate boardrooms of Brisbane and Sydney in Australia, Beijing, Singapore, Dubai, Tokyo and now here in Manhattan, New York. During the journey, the true Papua New Guinean spirit, character and resilience was represented by our State team, led by a core of dedicated and young Cabinet Ministers. This reminded me of my younger days when I was at the helm of a sovereign Government, after having led a core group of Papua New Guineans in our quest to secure political independence from Australia in 1975. Today my Ministers are engaged in the task of securing economic independence and national prosperity. Many Ministers and Members of Parliament gathered here have engaged with some of you on a wide range of issues to move the LNG project forward. I am sure these negotiations were not always easy. I am certain they have always been frank, open and cordial and, above all, focussed on achieving our national interest objective of ensuring national prosperity. I am sure you on your side have strived to drive the best value for your organisations. In many instances we began with positions that were far apart. We gradually worked our way to a middle ground that was mutually acceptable to Papua New Guinea and the project partners. The way forward always represented positive outcomes for all stakeholders. My Government came half way by providing greater fiscal security while recognising we were in competition with projects from other countries. Our common resolve produced the joint venture with valuable fiscal stability that made it possible for us to agree on optimal corporate tax arrangements in the win-win spirit I mentioned earlier. Our Ministerial Economic Committee and State bureaucrats outlined a broad tax structure that ensured that over the medium to long-term any major upside in oil and gas prices would be equitably shared by project participants and the PNG Government. This helped to underwrite the long-term security and stability of the PNG LNG Project. Turning back to the project negotiations, I should note that the conclusion of the initial round of discussions was marked with the signing of the PNG Gas Agreement on 22nd May 2008. That was a landmark that enabled ExxonMobil to commence Front End Engineering and Design (FEED). The Benefits Sharing Agreement that my Government negotiated with landowners in the footprint area has been as much of a landmark as the PNG Gas Agreement and the conclusion of FEED. I am not aware of any other country that conducts such negotiations. Our project partners tell me the same thing. Some 2,000 landowners gathered in Kokopo to participate in the Umbrella Benefits Sharing Agreement negotiations last May. Last December licence-based negotiations were held at the remote gas fields and other project sites. Thousands of landowners heard first-hand details about the Project and actively debated the level of landowner benefits with my Ministers and Members of Parliament. The package of direct benefits landowners will reap from the PNG LNG Project is around US$7 billion over the life of the project. 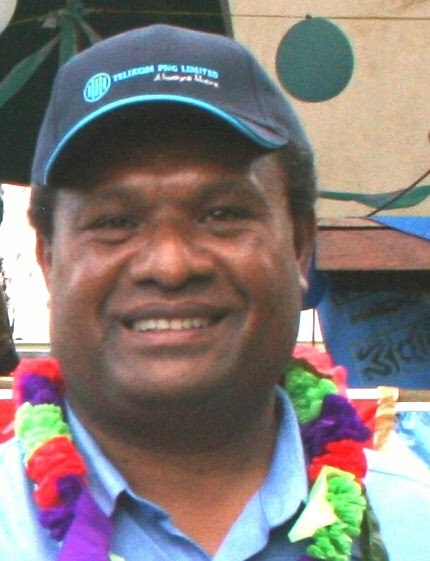 Landowner participation in resource ventures is unique to PNG – in this case there are some 60,000 landowners involved - and very much a part of the nation’s strategy of generating equitable distribution of wealth from any resource development. Providing landowners with a significant stake helps to mitigate risks by making the landowners an important stakeholder in the development. ExxonMobil, the world’s biggest oil and gas company, has secured for PNG this remarkable project. In record time, ExxonMobil has concluded the technical, marketing and financing agreements. We have gone in just over 18 months from detailed feasibility studies on one of the world’s most complex LNG projects to financial closure. We are often reminded that ExxonMobil has an excellent record in implementing LNG projects around the world on schedule and within budget. This is exactly the type of credible partnership that PNG seeks. PNG’s first LNG project represents the largest ever loan finance for any international oil or gas project. The critical FEED phase was completed in the final quarter of last year. It provided confidence that we had a viable project that could be completed in a set time frame. However, more parts of the complex puzzle had to be put together before the co-venturers could comfortably give the all-systems-go signal. One of these was finalisation in early March of the last of four 20-year Sales & Purchase Agreements for LNG. At the same time negotiations were finalised with potential financiers, particularly the Export Credit Agencies. We can appreciate that partly because of the Global Financial Crisis, the Government-backed ECAs were eager to provide financing to underpin potential exports of goods and services from these countries. It was also a difficult time for financial institutions to make big commitments. ECAs from the United States, Japan, China, Italy and Australia have come together to provide the bulk of the financing, along with 17 commercial banks and a significant slice of co-financing from ExxonMobil itself. I am glad ExxonMobil has helped PNG to keep such good company in the world of high finance. I am extremely proud that today’s ceremony celebrates your ability to have raised for my country a loan of US$14 billion for the PNG LNG Project’s 70 per cent debt financing component. This places PNG on the global financial map. I thank the Export Credit Agencies, the commercial banks and ExxonMobil for making this possible. In celebrating financial close with all of you, I wish to congratulate Neil Duffin, President of ExxonMobil Development Company, and Mark Albers, Senior Vice President ExxonMobil Corporation, and their respective teams for their tremendous work in tying together every loose end to bring us here to Manhattan tonight. The impressive team of individual ExxonMobil executives you have brought together, under Esso Highlands Managing Director Peter Graham, are a clear sign we have many more challenges before the first LNG shipment is made in late 2013. I appreciate the efforts ExxonMobil has made to go the extra mile. This is a journey we have undertaken together for almost three years. Some of my key Cabinet Ministers that have made this journey are here with me to enjoy the moment. The construction phase offers its own unique issues and challenges. In front of all of you today, I am urging my Ministers that they too need to go that extra mile in the coming four years to make this project come together as smoothly as possible. Let me affirm to you Neil Duffin and Mark Albers, my Government will ensure it does all that is necessary to assist you in the challenge of commissioning this LNG plant by the end of 2013. I am aware that we must face these challenges together. Any delay in the project schedule would result in cost blowouts that would hurt our overall achievements and goals. Having negotiated such a large loan we will only be able to service this loan once LNG exports commence. Success of the PNG LNG Project is closely linked to another recent achievement of my Government in its efforts to improve the living standards of our people. We will soon launch our National Development Strategic Plan covering the 20 years to 2030. Revenues that will flow from this project will underpin the ambitious targets laid out in that Plan. The success of the PNG LNG Project will represent a country-changing event. It provides the development context and the dimension of the economic and social revolution that our current generation will witness. Some of the development goals can only be delivered with smooth completion of the LNG Project. In many ways, this is another journey that the partners in the PNG LNG Project, and my Government, will forge towards a brighter destiny for Papua New Guinea. Through the Development Strategic Plan, the Government has made realistic assessments of our current situation. It has laid down practical targets for every segment of the economy, given the resources that will be available to Government. As I have noted in that document, our targets are aimed at creating a four-fold increase in per capita incomes in this 20-year period; and to improve the quality of life for all Papua New Guineans. This is a highly honourable task that my Government intends to undertake in conjunction with you – our friends and partners in the private sector. Once again I express my personal satisfaction and congratulate all stakeholders for this incredible effort in bringing us to financial close. STATE-OWNED ENTERPRISE Telikom PNG Ltd has partnered with St. Louis's Amdocs, the leading provider of customer experience systems to deploy Amdocs Compact Convergence - a network-connected, integrated solution for convergent real-time charging, customer care, self care and value-added services (VAS). In a statement to the New York Stock Exchange (NYSE), Amdocs Compact Convergence said this solution is part of a larger project in which Telrad Networks Ltd., a leading network equipment vendor, is upgrading Telikom PNG's entire network infrastructure. Currently, Telikom PNG's fixed-wireless, wireline and high-speed data offerings, including WiMAX, ADSL and broadband satellite including prepaid voice, data and SMS services is supported by Amdocs Compact Convergence. Telikom's Chief Executive Officer Peter Loko (above right) reportedly said the move is in the right direction for the company. "Using a single solution to manage our products, services and pricing offerings, across all our networks, will allow us to focus on expanding and enhancing our core business," said. Given the local environment, it's crucial to remain competitive by providing services that consumers want and by keeping operational costs low. The Amdocs Compact Convergence solution will help us do just that." According to the statement on NYSE, the Amdocs Compact Convergence solution will be used to introduce new services such as calling cards, top-up vouchers and multi-wallet capabilities that enable subscribers to use a different wallet for a product or service. In addition, the solution includes a multi-lingual interactive voice response (IVR) for self-care services such as balance query, balance announcements, top-ups and money transfer. With a single solution and low maintenance and operational costs, Telikom PNG will reduce its total cost of ownership. Telikom PNG will also be able to strengthen its competitive position with new services and pricing options and offer customers an enhanced and personalized experience. Specifically designed for growth markets, new technologies and new business models, Amdocs Compact Convergence is a complete network-connected solution which enables service providers to quickly design, launch, charge for and manage new offerings. Labels: Telikom's Chief Executive Officer Peter Loko.